Akshay Kumar's Crack Vs Shah Rukh Khan's Next! Home BOLLYWOOD Akshay Kumar’s Crack Vs Shah Rukh Khan’s Next! Akshay Kumar’s Crack Vs Shah Rukh Khan’s Next! This is the first of a kind promotional stunt. Salman Khan, who isn’t even part of Imitaz Ali’s upcoming untitled venture, announced the date of the release of the film that stars Shah Rukh Khan and Anushka Sharma. Tentatively titled The Ring, while the makers are still on the hunt for a better title, the poster on unveiled on Twitter by Salman didn’t have a name, but just a date, August 11, 2017. However, this release date has got a lot of eyebrows raised. The date indicates that it’s going to be Independence Day 2017 release. 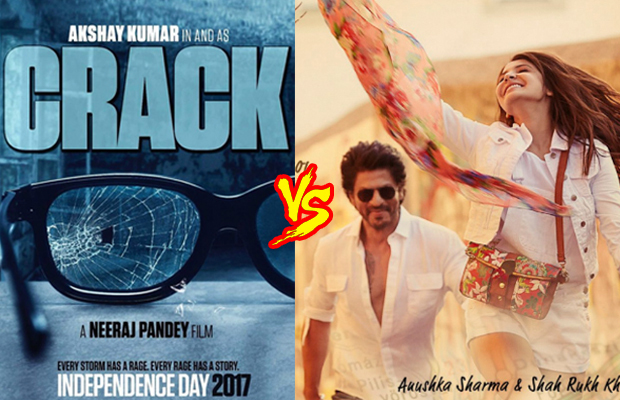 A few months ago, Akshay Kumar unveiled the first look of his upcoming film Neeraj Pandey’s Crack stating the release as Independence Day release; which means we might see an Akky vs SRK clash on box-office next year. Akshay Kumar has taken liking for Independence Day after the success of Rustom. He has also announced films for the next two Independence Day release – Crack in 2017 and Reema Kagti’s directorial venture Gold in 2018. Shah Rukh Khan’s is a musical love story, the genre SRK is a king of, on the other hand Akshay Kumar is returning with director Neeraj Pandey, a winning combination so far. There is a chance of it being postponed from Akshay’s end as he has not even begun work on Crack, but Shah Rukh has filmed half the movie and will soon wrap up the remaining portions. On the other hand, Akshay has his hands full with Jolly LL.B, Robot 2.0 and Toilet – Ek Prem Katha. We wait for the official date to be announced by the Crack team, but whatever it maybe, there is a chance of an overlap. Previous articleWatch: Inside Yuvraj Singh- Hazel Keech’s Wedding Cocktail Party! Next articleVideo: Ranveer Singh Did NOT Kiss Deepika Padukone At Awards, Then Who Was She?